From Hakone-Yumoto I took a train to Odawara and there, I made a change and took the Shinkansen to Nagoya. The Shinkansen trains are famous because of their speed, punctuality and security. My pass was valid for all the Shinkansen trains except the fastest one, called Nozomi. This time, I took a Kodama Shinkansen which was the slowest, I think, because it stops at every station. The rest of times I took a Hikari and I could notice the difference. I never made a seat reservation (although it was free with my pass) because they are passing by all the time. My first impression of Nagoya was definitely good: big buildings with advertisements from technology brands, like Hitachi or Panasonic, impressive elevated highways, wide avenues, workers in suit everywhere. 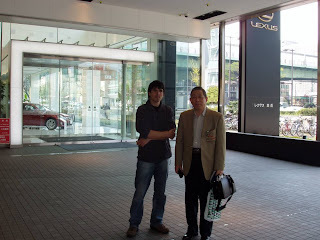 I had a shower in the Ryokan (Japanese hotel) where I was going to spend my first night in Nagoya, checked my e-mail and then I made a call to my contact in Nagoya, Tokujun Satoh. 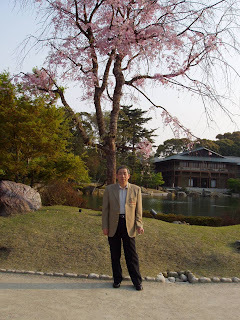 Mr Satoh is a professor of Spanish at the Aichi prefectural University and my relation with him comes from my Japanese teacher, Tatsuhiko Hattori, who was born in Jimokuji, near Nagoya. 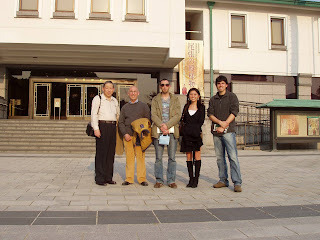 They were friends and partners at the Nanzan University before Hattori came to Santander. They were born just after the second world war finished, very tough times for Japan. Satoh was VERY nice to me (like all the Japanese people I met, actually!!) and I would like to send him another BIG THANK YOU from here. 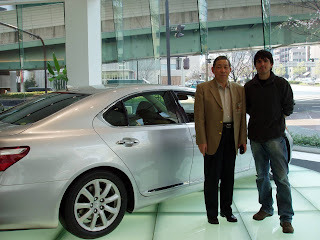 We met up at the Lexus offices in Nagoya because he has bought a Lexus car, and they give him this FREE service consisting on having a quiet lounge at the Lexus offices where you can go whenever you want to, and ask one of the several hostess for a cappuccino or something while they clean your car (yes, amazing!!). We had a very nice first talk in Spanish there. He spokes Spanish very well and he is also a figure on the Catalan language (he lived in Barcelona for sometime). I gave him, on behalf of Hattori, a modern Spanish dictionary that includes the differences among the latin countries in the use of this language. It was hard to carry it through the Hakone mountains but, DEFINITELY, it was worth the effort. After the Lexus break, we had some tasty food in a restaurant called Denny's (very useful because there is a parking bellow) that had an interesting Wireless system for calling the waiter to come. 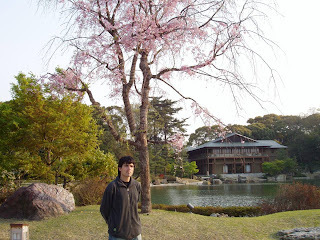 From there, we went to make a short visit to one of the main turistical points in Nagoya, the Tokugawa museum, which turned up to be quite interesting. In the museum, we met by chance a former student of Satoh and its husband, a Spanish guy from Málaga (it's a small world!!). After that, he left me in Sakae, the amusement part of Nagoya, because he is also a buddhist bonzo and he had to assist to a funeral for a recent death. Sakae was similar to shinjuku, lots of amusement locals, karaokes, clubs and "salary men" going out. 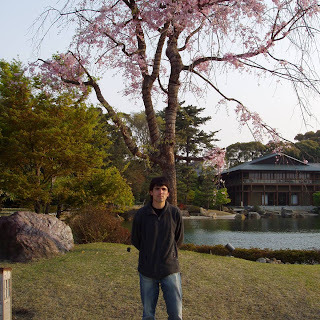 I was wandering there for a while, hearing the sounds and looking at the neons with my mouth open and then I went back to the Ryokan (I had to rest for the next day, you'll see in the next post! ).